Meor Einayim, Chassidic essays on the Torah, by Rebbe Menachem Nachum [Twersky] of Chernobyl. Slavita: [R. Moshe Shapira, 1798]. First edition. 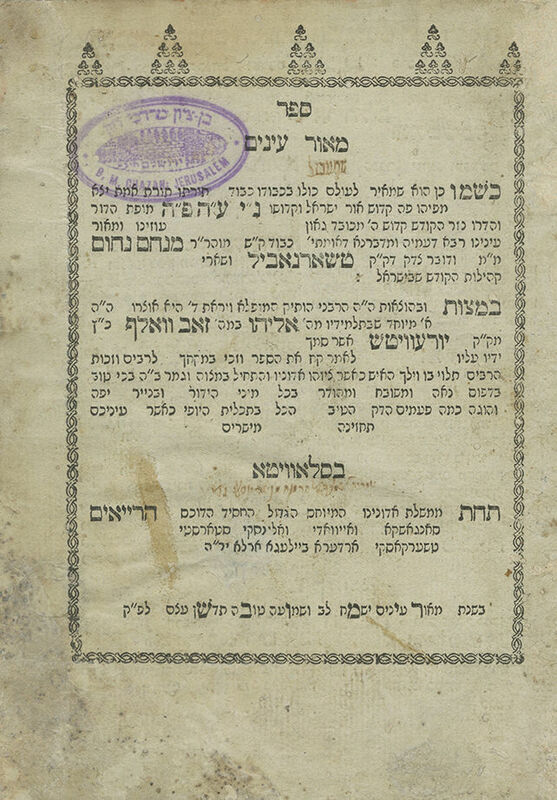 Bound with: Yismach Lev (Part II of Meor Einayim), commentary on Aggadot and Midrashim (following the order of the Talmudic tractates), by Rebbe Menachem Nachum [Twersky] of Chernobyl. Slavita: [R. Moshe Shapira, 1798]. First edition. Meor Einayim is a fundamental work of the Chassidic movement, and one of the first Chassidic compositions presenting the teachings of the Baal Shem Tov and the Maggid of Mezeritch (Mezhirichi). The author, the maggid R. Menachem Nachum of Chernobyl (1730-1798, Encyclopedia L'Chassidut, III, pp. 168-175), was one of the founders of Chassidism and the progenitor of the Chernobyl dynasty. He studied directly from the Baal Shem Tov and was a close disciple of the Maggid of Mezeritch. He served as maggid in Noryns'k, Pohrebyshche and Chernobyl. He acceded to his disciples' entreaties to print his teachings and delegated the task to his disciple R. Eliyahu son of R. Zev Wolf Katz, instructing him to publish his writings in the "fine and exceptional printing press established in Slavita…" (the printing press of R. Moshe Shapira, then in its early years). The book was allegedly eighteen times longer, but when arranging it for printing, R. Nachum of Chernobyl commanded his disciples to burn many leaves, leaving only the teachings which were divinely inspired. His writings were divided by his disciples into two parts, one part on the Torah, including selections, published under the title Meor Einayim, and a second part pertaining to Talmudic aggadot, named Yismach Lev. The two parts were printed concurrently in Slavita, the same year. In later editions, the two parts were combined and published together. R. Nachum of Chernobyl passed away during the course of the book's preparation for print. Chassidic leaders ascribed great importance and holiness to the book, studying it every day and preserving it as a protection. The Chozeh of Lublin and R. Yitzchak of Skver (grandson of the author) reputedly said that the book has the power to light up the person's soul, similarly to the Zohar, and R. Yitzchak Izak of Komarno asserted that Meor Einayim should never depart from before one's eyes, as all the teachings it contains are lofty and holy. Signature on title page: "Shemarya Shmerel son of the late [?] Menashe Yosef". Stamp of R. "Ben Tzion Mordechai Hazan" (foremost Torah scholar of Iraq and Jerusalem, disciple of the Ben Ish Chai, founder of the Porat Yosef yeshiva in Jerusalem). Two complete books, bound together. , 160; , 33,  leaves. 19.5 cm. Many blueish leaves. Most of the book in good condition, several leaves in good-fair condition. Stains. Dark stains, tears and damage to first title page and several other leaves in various places in the book, slightly affecting text in places, repaired. All the leaves were professionally cleaned and restored. Pen markings in several places. Several leaves trimmed close to text. New leather binding. Stefansky Chassidut, no. 308; no. 237.